EagleGet is popular downloader software that simplifies and automates downloading file from many shareware and premium download sites. EagleGet Password Decryptor helps in quickly recovering all these stored download site login passwords from EagleGet database. 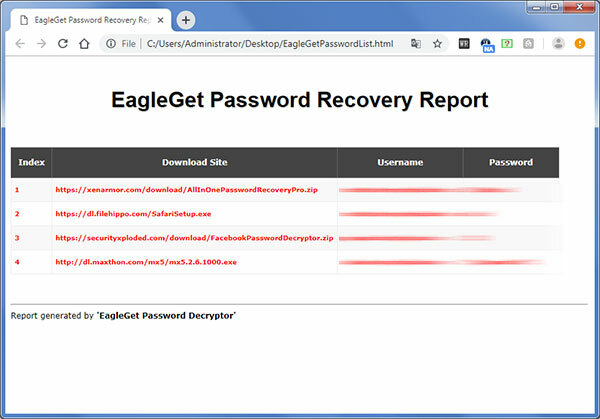 Instantly decrypt and recover stored download site passwords from EagleGet Downlaoder. Recover all stored passwords of any length and complexity. Automatically detect EagleGet Password database file. EagleGet Password Decryptor comes with Installer which helps in local installation & uninstallation of the software. It has intuitive setup wizard which guides you through series of steps in completion of installation. Next click on 'Show Passwords' button. Instantly all the stored download site passwords by EagleGet will be recovered & displayed as shown in screenshot 1 below. Screenshot 1: EagleGet Password Decryptor showing all decrypted passwords from the EagleGet. 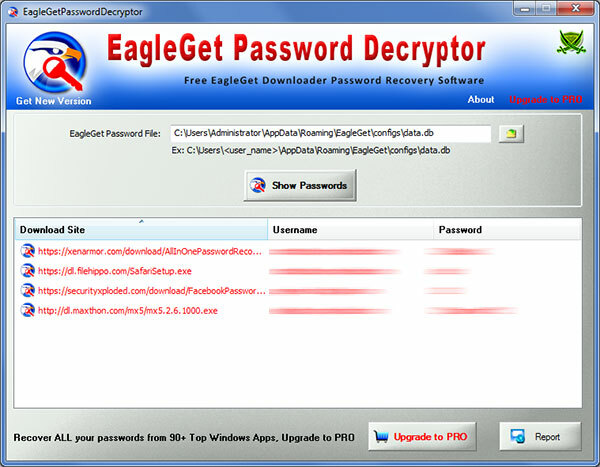 EagleGet Password Decryptor is not a hacking tool as it can recover only your stored passwords. It cannot recover the passwords for other users unless you have right credentials.